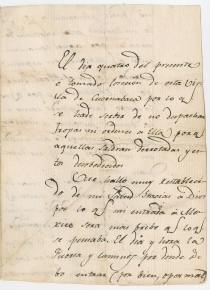 In this bold letter from an early leader of the Mexican War of Independence, José María Morelos informs the Spanish viceroy, who represented the authority of the Spanish crown in New Spain, that his forces had taken Cuernevaca, thirty-five miles south of Mexico City, and warns him not to attempt to send troops, who would only be defeated. Morelos boasts that he will soon take the rest of Mexico. He adds tauntingly that he cannot tell Venegas the day or hour when his forces will enter Mexico City. 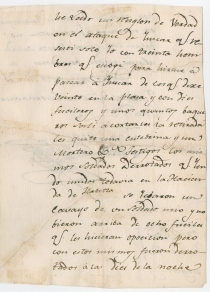 This important letter also reveals the little-known fact of Morelos’ previous training in the artillery, as he remembers Venegas from his time as part of the Real Cuerpo de Artilleria. He also provides an account of the attack on Yzucar to correct the misrepresentations in the press. Despite rumors of his failing health, Morelos declares that he is well-rested and in great health. JOSÉ MARÍA MORELOS PÉREZ Y PAVÓN. 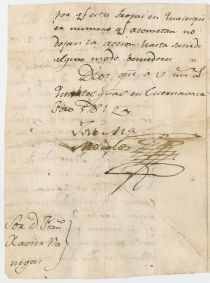 Autograph Letter Signed, in Spanish, to Francisco Xavier Venegas, February 5, 1812, Cuernevaca, Mexico. 4 pp., 6 x 8 ¼ in. Viceroy Venegas sent a force of 5,000 Spanish royalist soldiers under the command of Félix María Calleja to hold Morelos in check and to avert an attack on Mexico City. A few days after Morelos wrote this letter, Calleja’s forces attacked the town of Cuautla, twenty miles southeast of Cuernavaca, and its Mexican rebel defenders under the leadership of Morelos. After the failure of an initial assault on February 19, Calleja settled into a siege of the city that lasted for three months. On May 2, Morelos withdrew his forces from the city, and both sides claimed victory. On the fourth day of the present month I have taken possession of the town of Cuernavaca, do not send troops or orders because the troops will be defeated and the orders disobeyed. I find my health much improved, thank God, and my entrance to Mexico City will be sooner than I had thought. The day and the time, the force and the roads through which I should enter (for better or worse) <2> I cannot confirm with you, and only out of charity am I sending this General News, because of that understanding we had in Spain, while I was in the Royal Artillery Corps, and also because I don’t hold you to be as guilty as the others, European tyrants and sovereigns, who have gotten themselves into a briar patch out of which they will never return. I have seen all of the gazettes and all of the parts they’ve given are false, hugely false; they have tricked you and the public, fooling you about the kingdom and fooling the public about this and that of Spain. <3> I have read only one line of truth about the attack in Yzucar which I resisted alone, with thirty men whom I chose to go with me to Yzucar from among those twenty in the plaza and ten with rifles and a number of horsemen I left to tell them about the retreat and took from them a culverin [cannon] and a mortar. Witnesses would swear that these are the very same defeated soldiers that were still united on the Plantation of Tatetla. They took a horse from one of my soldiers and didn’t look up to see the eight guns which confronted them, but these themselves were defeated at night <4> because these troops in whatever number they attack don’t leave the action until they are victorious. Jacinto Reynoso (gift from the family of Morelos); thence by descent. This letter is likely Morelos’ retained copy. 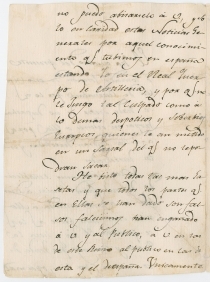 There is apparently also a copy of the letter in the Benson Latin American Collection at the University of Texas. Professionally mended tears, including several that run the length of the entire sheet; faint traces of prior mending. José María Morelos Pérez y Pavón (1765-1815) was born in Valladolid and studied at the Colegio de San Nicolás Obispo there. He was ordained a priest but took no vow of poverty, so he engaged in business to support himself. At the beginning of the Mexican War of Independence in 1810, Morelos joined the movement, gathered an army, and in his first nine months as military commander won twenty-two victories, destroying three Spanish royalist armies. He took over leadership of the war after the death of Miguel Hidalgo y Costilla in 1811 and continued to gain victories in 1811 and 1812 in southern Mexico, where he captured Acapulco and Oaxaca. In 1813, he called for the National Constituent Congress of Chilpancingo to consider political and social reforms he outlined in a document titled “Sentiments of the Nation,” considered the Declaration of Independence of Mexico. In September, the Congress met and endorsed the “Sentiments,” declaring independence from Spain, establishing the Roman Catholic religion, and formulating the branches of government. Offered the title of “Generalissimo,” Morelos refused and asked to be called “Servant of the Nation.” His military campaigns of 1814 and 1815 were not as successful, and royalist forces captured him in Tezmalaca in November 1815. He was imprisoned in Mexico City, where he was tried and sentenced to death for treason. He was executed by firing squad on December 22, 1815. After his death, his lieutenant Vicente Guerrero continued the war for independence. He is now considered a national hero of Mexico and has appeared on both coins and paper currency. Francisco Javier Venegas (1754-1838) was born in Zafra, Spain, and began studies for a literary career. He gave them up to serve in the military, where he rose to the rank of lieutenant colonel in battles against the French Republic. He retired but returned to service during the Napoleonic invasion of Spain. After suffering several defeats to French forces, he was appointed military governor of Cadiz in 1810. When a dispute arose with another commander over who was the superior officer, the Supreme Central Junta appointed Venegas as Viceroy of New Spain. He arrived at Veracruz in August 1810 and took his position in Mexico City in September. Within days of Venegas’ taking office, Mexicans under the leadership of Father Miguel Hidalgo y Costilla rose in rebellion. After initial losses to the rebels, Venegas’ forces began to defeat the insurgents. In 1811, royalists captured and executed Father Hidalgo, but other rebel forces remained under the leadership of Ignacio López Rayón in central Mexico and Father José María Morelos in the south. Back in Spain, the Cádiz Cortes announced the first Spanish constitution in March 1812 and ordered its publication in all Spanish possessions. Venegas delayed its publication and then rendered it moot by declaring New Spain in a state of siege. The Cádiz Cortes relieved Venegas of his post in September 1812, but he was not replaced by General Calleja until March 1813. Venegas immediately returned to Spain, where the king rewarded him with the title of Marqués de la Reunión y de Nueva España.